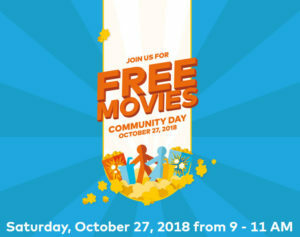 Saturday, October 27th, is Community Day! From 9 – 11 am. Visit your local Cineplex theatre to watch FREE movies and enjoy incredible savings on Popcorn, Drinks & Candy, and a special SCENE point offer! Doors open at 9am. No tickets required.